HS-FS100-L Indicator Light Sensor Now Available! It's worth mentioning here as it's only written on the second page of the manual: This device will act as a Z-Wave repeater when included on USB power. Any way this could detect a blinking indicator that normally is on? Does this keep track of only one light? Just on or off? Our washer light is red until it completes and then changes to green. Could this device detect the change in color? Don- it detects change. The change can be from off to on, on to off, or from color to color. yes. it will detect a change and simply report it as a change of color. Just received and installed the FS100 to detect water under the washer in the laundry room. Quarters are so tight that I could never get one of the other water sensors on my system into position under or behind the washer. Okay, I could, but I'd never be able to retrieve it to replace batteries. The water sense cable solves that problem as I can have the unit on the counter above the washer/dryer. It has, however, prompted a question about the child devices that I've pondered before. The child device "water notification" is obviously the one to test for the presence or absence of water. Likewise "battery" and "temperature" are obvious. But what is the purpose of child devices "sensor binary" and "switch binary". Switch binary controls the built in buzzer. Sensor binary is provided for compatibility with other (non-HomeSeer) hubs. 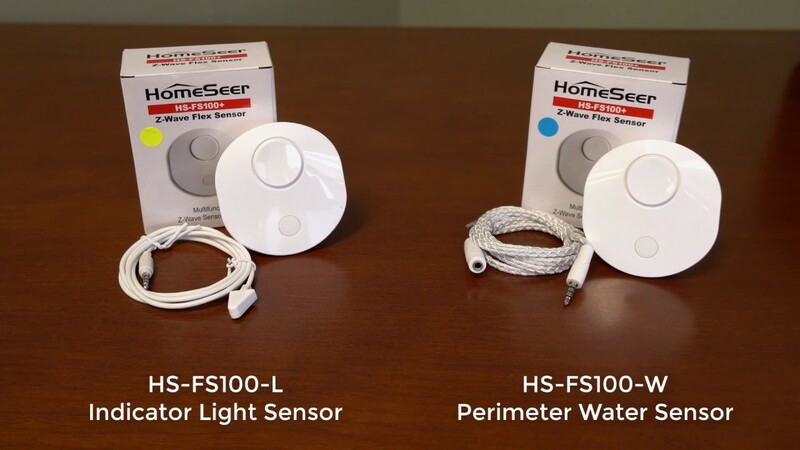 in that case, can the "Sensor binary" child device be safely deleted in HomeSeer? How many sensors does it support? For example, can the HS-FS100-L support a light sensor and a water sensor? Or, 2 light sensors? It only has one input jack so it probably can only support one sensor at a time, so only one light sensor or one length of water sensor. You can daisy chain multiple water sensors together to make a longer water sensor. Sure would have been nice if the interface was 1-wire then if could have been setup for multiple sensors. A good example would have been for a washer. You could have more than one light sensor so you could detect faults as well as on plus water. The device would then return all three values. However, if it were 1-wire it would probably require some sort of electronics in the sensor as well as power to make it work. This increases complexity and cost. From the pictures it looks like it has a 3 wire cable which likely, but by no means assured, that the cable has GND, +V and Signal/Sensor lead.